What are your optimum manufacturing software systems for your food and beverage contract manufacturing business? How do the software systems help you manage manufacturing, supply chain, customers and a broad range of other business areas, by minimizing the need for multiple systems? Your solution needs broad built-in functionality supporting build-to-order, engineer-to-order, and build-to-forecast supply chain models, across both discrete and batch-process manufacturing modes and is particularly well-suited to manufacturers operating in a mixed-mode environment. Your full-scope solution includes applications for financial management, customer relationship management, supply chain management, warehouse management, human resources and payroll, project management, business intelligence, lot tracking and quality control, and paperless manufacturing; printing, storage and retrieval. The best Contract Manufacturing ERP Solution gives you the adaptability you need to take advantage of new revenue opportunities. Provide Better Customer Service. Good service will make customers want to do business with you again and again. When customers know that you can answer any question about an order at any given time, they won’t look elsewhere. Being able to respond quickly to customer changes and questions gives you a competitive advantage. Order promising gives you the ability to promise your customers a reliable delivery date immediately, on request. With the Contract Manufacturing ERP Solution, rush orders can be planned immediately from the sales order. Orders can be modified at any point in the production cycle. Multilevel production orders improve coordination of made-to-order requests, and simplify the implementation of make-or-buy decisions. Multidimensional tracking allows you to respond instantly to customer inquiries about order status. Access tracking to the dispatch list allows the shop floor manager to determine which customers would be affected if you moved a job. The Contract Manufacturing ERP Solution allows you to instantly change your manufacturing methods and processes, helping you to keep up with changing customer needs. You can modify components and operations on the fly, even on released production orders. When a change occurs, you can update and replan all materials, costs and operations simultaneously, without time-consuming batch jobs. Multiple planning options, tracking, and action messaging allow you to quickly and easily make exceptions and last-minute changes to give customers what they want, when they want it. You can plan from the sales order, the production order, the purchase requisition, or by traditional MPS/MRP planning methods. Furthermore, purchase planners can easily recognize how to adjust supplier delivery schedules to take advantage of new revenue opportunities. When a customer’s needs change, you can easily incorporate the changes made on the shop floor to optimize the current workload. For example, parallel routing enables you to create critical operational paths for make-to-order and project manufacturing. The Contract Manufacturing ERP Solution provides powerful planning tools that give you the freedom to choose the optimum manufacturing process for ultimate profitability. For example, when planning production orders, you can plan product family orders that share the same routing. This allows you to make more efficient build schedules. To help you better meet customer demand, the Contract Manufacturing ERP Solution supports efficient collaboration with long-term partners through the use of blanket orders. The Contract Manufacturing ERP Solution is designed for maximum operational and setup flexibility, so that implementation time is reduced to a minimum. You can fine-tune the system while it is working and easily implement changes as your operations demand. Furthermore, you don’t need to forecast all manufacturing scenarios during setup – you can respond on the fly. Contract manufacturing for the Food and Beverage industries has unique, time-sensitive demands from order to fulfillment. Food and beverage products have life-cycle, shelf life and spoilage trappings which can cause storage and transportation limits. Having the systems in place to support these critical knowledge points helps companies to trust their processes reliably. 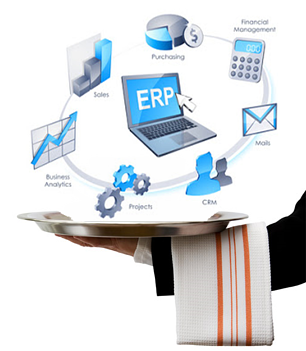 Santa Clarita Consultants delivers a fully integrated ERP suite of business software solutions which provides complete control over the planning and management of all facets of your business including accounting, manufacturing and distribution.